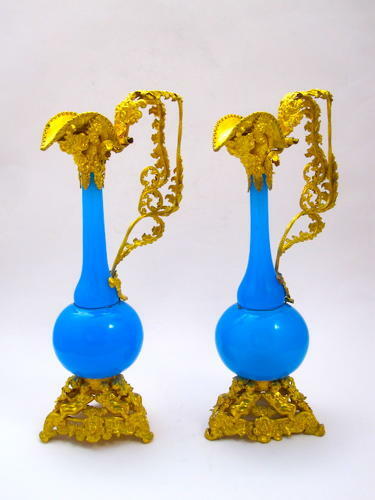 A Large Pair of Extremely High Quality Dore Bronze and Blue Opaline Glass Ewers. Wonderful Intricate High Quality Dore Bronze Mounts With Fancy Scroll Handles and Spout with Classical Figures and Flowering Cornucopia. The Bases is Intricately Sculpted with Pairs of Cherubs, Flowering Swags and Shell Feet. An Impressive Pair of Vases.